This site discusses psychology, philosophy, and spirituality as an investigation of human life. 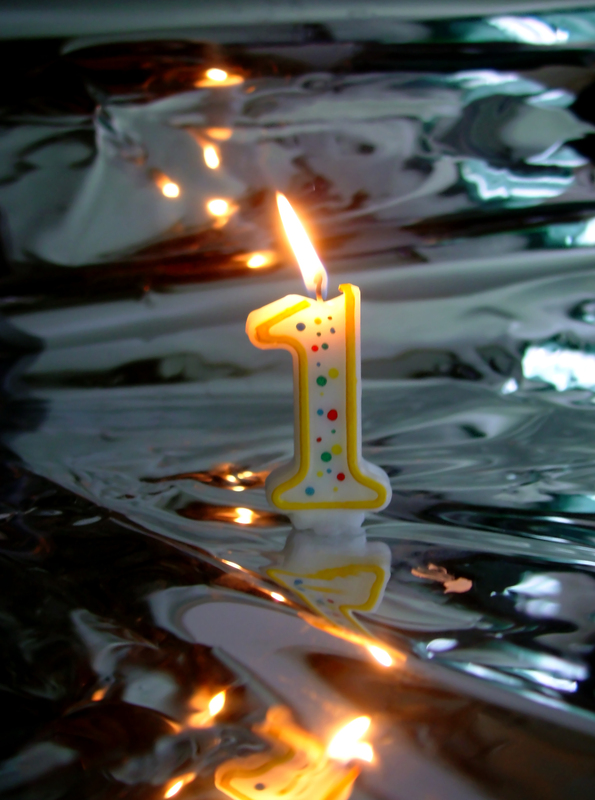 I started this blog a year ago, and so much has been unfolding throughout the 12 months since. Also, I just posted the blog’s 100th post in the last few days, a good place to mark the end of this year’s journey. I’m grateful for all of your comments and likes. I am thankful for your companionship on the Way–searching for wisdom and a way of expressing it to all sentient beings out there. May we continue to dance along the Way together, and may these writings be to the benefit of all who read them. What this phrase would intend? Can All be measured in wrong or right? Is value so readily inherent? Is Truth just personally apparent? Must we choose eternalism or nihilism? After a storm at sea the sailor heads for home and quiet harbor. 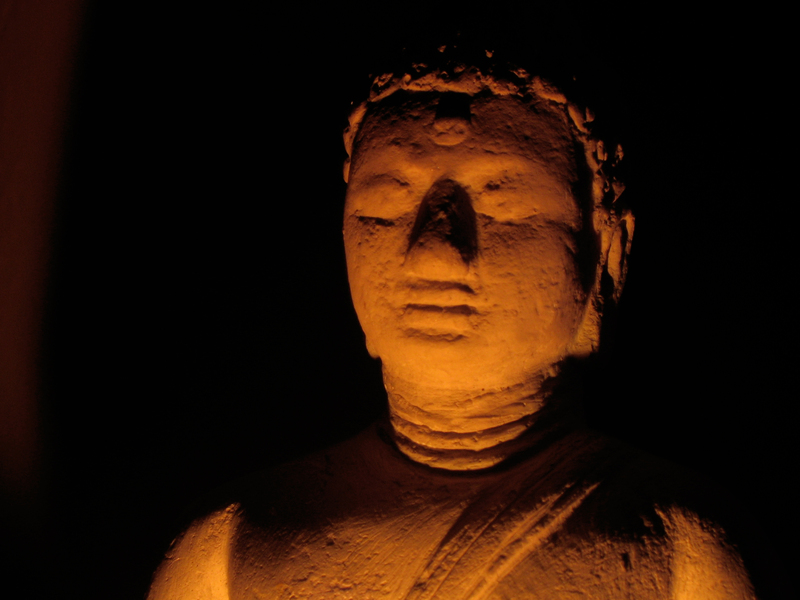 we must return our unsettled mind to the center. Tao is within us all. many aspects but only one essence. Though we are not bound, we are always connected. into the highest hills and all over the world. Nothing beyond, Nothing in hand. without shape, we understand true nature. with the boundless Way, we understand truth. May this help you see beyond dualism and the relativistic pat on the back that can come with your own Stories–that is “My Truth”. Here’s another set of Morning Pages philosophical thoughts. Enjoy! Floating through–a bubble on the surface of a river. 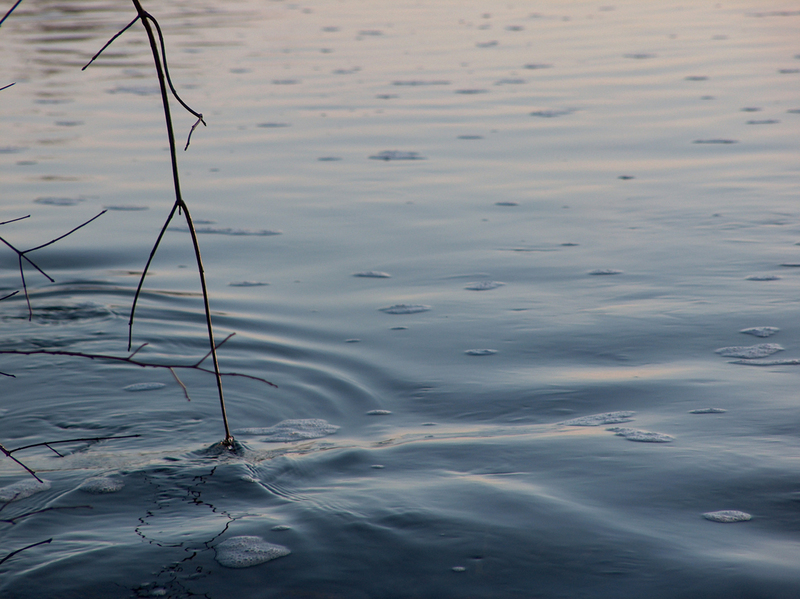 The fragility of it and the shining beauty–yet not separate from muck and refuse also floating by in the water. Separate? Does such a word make any deep sense? Of course the bubble is distinct from the banks of the river, but where does the bubble end and “the river” begin? Also, could one truly be without the other? You may say that the river could, but it would be a different river, and would either be without the banks? What is separation? This image is a metaphor for life, and the last point stands to remind us that “my” life as separate, as independent, is equally implausible. The universe would not be the same without me in it, but we usually stop there and make this into some sort of grand creed of the ego–“My existence is of universal importance!! !” Thus do we beat our chests at the confusion and existential anguish of the questions: “Why am I here? What is the point of it all?” Thus do we cover over our fear of death and nonexistence, trying to overlook how that bubble could so easily pop and that we cannot begin to understand or conceive of what it would be like to dissolve from bubble into river–to have the “I” dissolve into whatever it may become when this body pops in its own way. We must not stop with this roar at the uncertainties of our embodied, impermanent life. The other point was that I am not separate from the universe. The bubble would not be, if not for floating along on the water. Words deceive here. It is not the river, and yet it is the river. It flows differently than the water around it, but it is composed of the same water and shows us merely a different way that all the particulars of the river’s flow can manifest, albeit briefly, as one possible occurrence in the ever-changing flow of flux. Here is the mystery. Here is Tao, shunyata, Source, or the divine spark. Here is what you should spend your time observing. The universe universes the universe, right here, right now–right everywhere, right always–and “I” am not a separate, “independent” observer. I am that unfolding splendor in one tiny, localized manifestation, clearly not the whole yet not separate from the whole. Such mystery cannot be adequately represented in words, only indicated, only shown. Look. 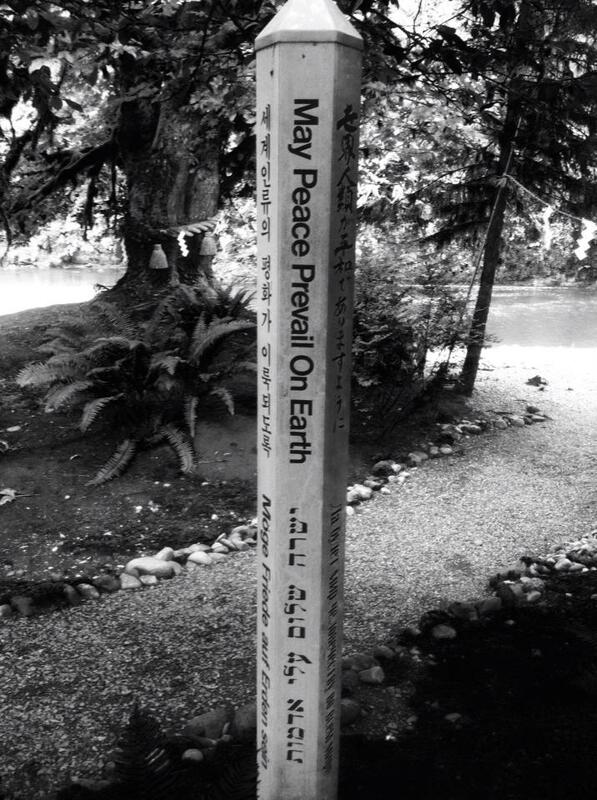 May All live with ease. May this bring you insight and inspire you to look deeply at all you encounter. This is my first deep writing in a while. Yet again, it appears unexpectedly in the open space of Morning Pages. Enjoy! Here we are… Another day. It’s great to be writing in this moment. As I slow down and attend to the process, I feel utterly awash with sensation. There is so much detail–sound, smell, light, touch, vibration–in every moment. Usually, though, we’ve shut much of it out as we narrow our vision/smell/hearing/etc. to some small set of attention. There’s nothing wrong with that. In fact, its’ somewhat necessary. There’s so much to experience that we can’t hold it all at once. It’s the same with our thoughts. A quiet moment of mindfulness reveals that they are a legion; however, in most moments, we’re running along with one in particular as though it were a huge kite yanking along a child on a windy day. The funny thing in each instance is our lack of awareness of the process and possibility in each. With sensation, we forget that there is so much that we are closing out in this moment, or maybe, we don’t forget as much as not even realize that’s happening. With the thoughts, the same: we don’t realize that we are holding onto that kite string and running along with them (the thoughts). Meditation can show us both that there is so much to be aware of in every moment, bodily, and so many thoughts flitting by, mentally. It can open us to our full unfolding, right here, right now. It also shows that those thoughts are not “me”. I don’t have to run along with them. I can just as readily let them go–that kite can just fly away. It is only in grasping to it that I give it the power to pull me here and there. I can just as readily watch it fly on the wind without feeling its pull. 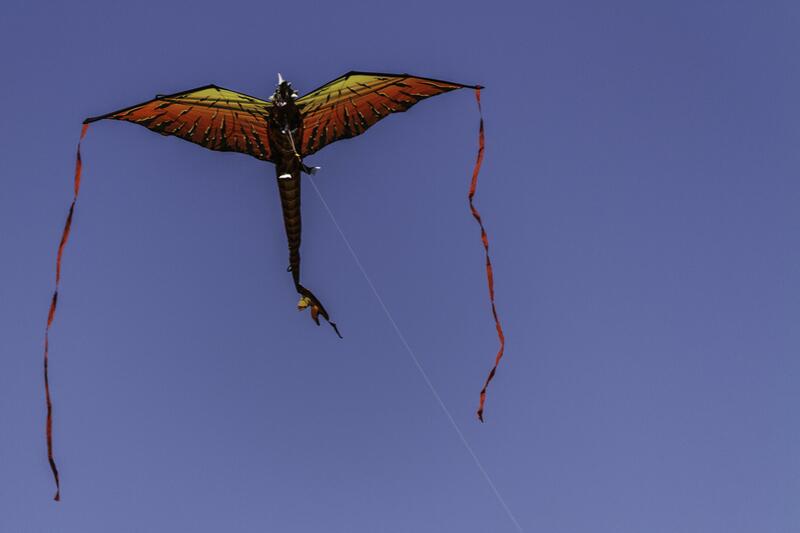 Whether that kite is in the shape of the most beautiful butterfly or the most terrifying dragon does not make it any more enduring, any more absolute. It’s just another passing moment, another gust of wind. In grabbing onto the string, I keep it flitting about in the broad, open expanse of my mind; otherwise, it will pass out of sight soon enough, and I have the opportunity to watch it soar by without mistaking that string and kite as an extension of myself–as an immutable truth that defines me. In this moment and in every “now”, “I” am a flux of all these sensations and thoughts, a huge amount of possibilities manifesting in reality. It’s one small fold of the universe universing itself; it’s an unfolding emergence; it’s a human becoming. May this help you let go of that kite, seeing the unfolding potential that is in every moment. May you find the liberation of not grasping onto thoughts and definitions, thereby taking the first steps out of the orbit of samsara. 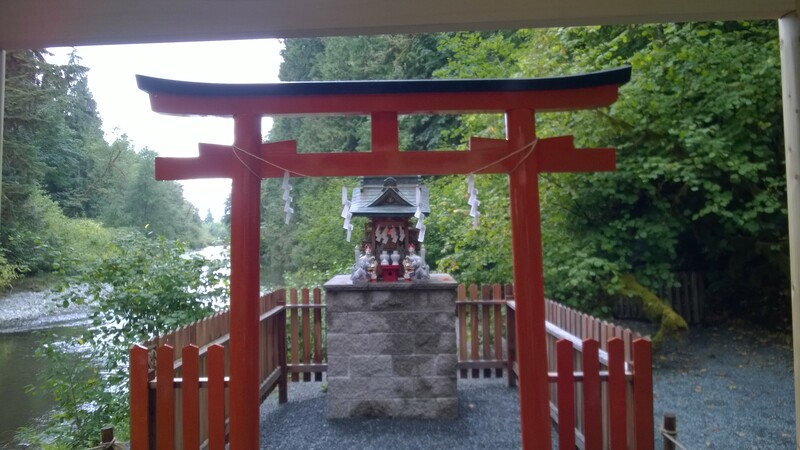 Recently, I went to the Tsubaki Grand Shrine–the 1st Shinto shrine built in North America (although moved from its original location in California to the current one in Washington State). It’s only about an hour drive from my place, surprisingly enough. 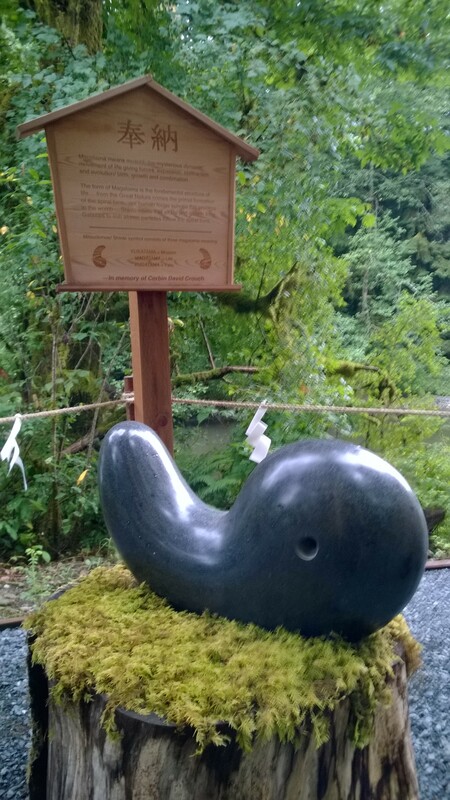 It’s located in some serene woods northeast of Everett, WA. It sits nestled amidst trees, alongside a soothing river. 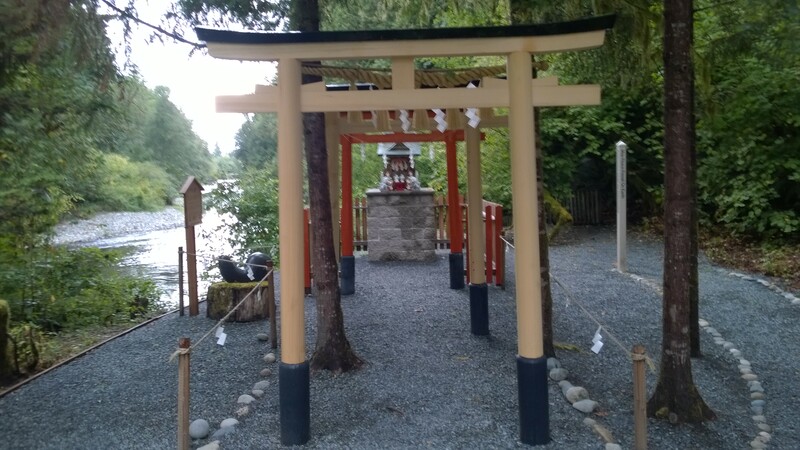 I can think of no better location for a religious shrine of a tradition that praises nature in all of her rhythms, cycles, blessings, changes, and unfoldings. 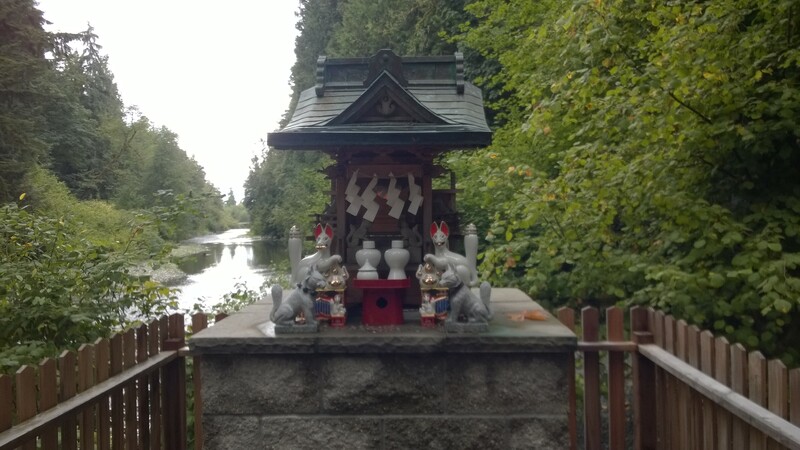 There were many altars, laced with traditions and rituals, speaking to the genuine Japanese heritage of this shrine–not some second-rate American attempt. 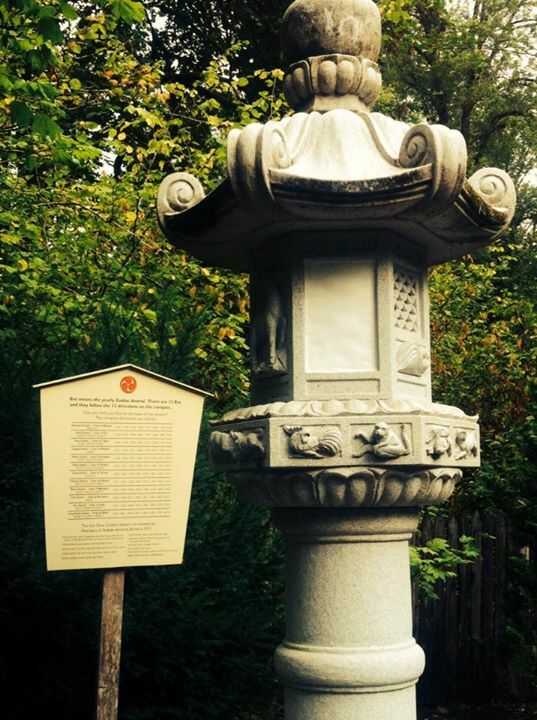 For instance, there was a column with the animals of the Chinese zodiac carved around it, chasing each other endlessly through the ongoing years of the calendar. There was also a basin with long-handled wooden ladles for cleansing one’s hands and face before entering the nearby door to the shrine proper. The basin lay below an awning, keeping the water from being fouled by falling leaves, and a wise, kindly dragon stood above and behind it, his stony visage protecting from spiritual impurities. A few steps away, a thick rope hung from another awning, attached to a large bell. This implement for announcing oneself at the temple entrance was above another basin–this one empty of water, but the open space was meant to collect offerings from visitors. I’m standing at the entrance in the background, and the washbasin is in the foreground to the right. The description of the shop that follows is hidden behind the washbasin area. To the right, a window displayed many small amulets and talismans that visitors can purchase for blessings in the year ahead. My companion and I asked questions about the amulets, and the middle-aged, Japanese woman called out to her “sensei” to help us. She disappeared behind a partition and was soon replaced by a white-haired, Western man in his later 50s who answered our questions with gusto and greeted us to the shrine. He even let us inside to use the restroom despite the entrance having been cordoned off for the day already. He pointed out a “portable shrine”–a large, golden relic atop wooden struts with colorful supports holding the shrine in place–and explained there are festivals which will require this. One is in Bellevue in September. We immediately agreed to go. Here it is as well as the shrine’s reverend. 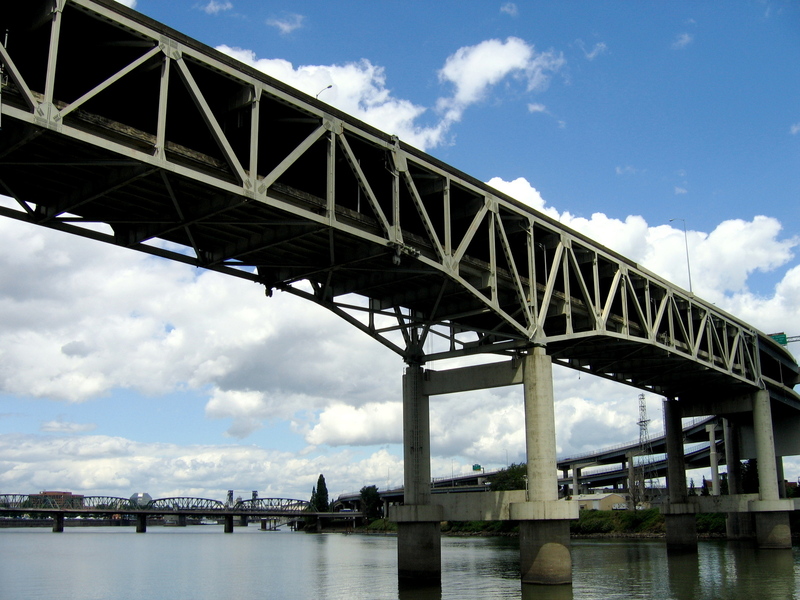 This was found on the Northwest Public Radio’s site: nwpr.org. 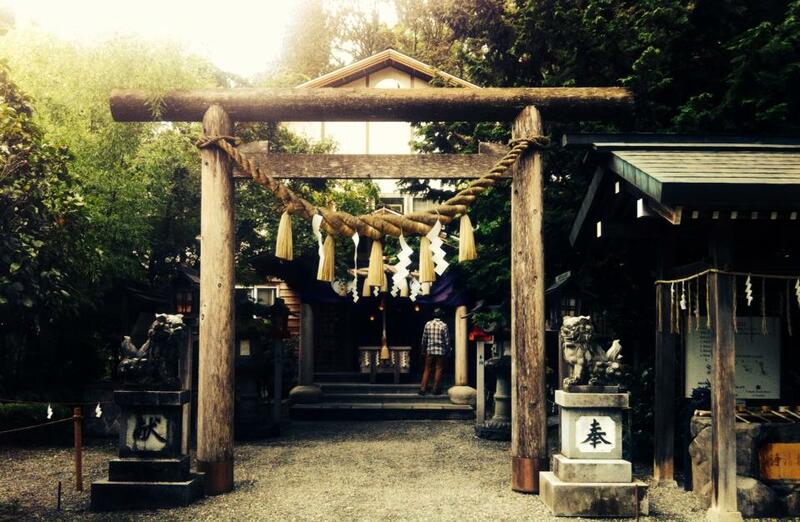 After this, we walked outside and looked at the other altars for blessings and contemplation below the main shrine. 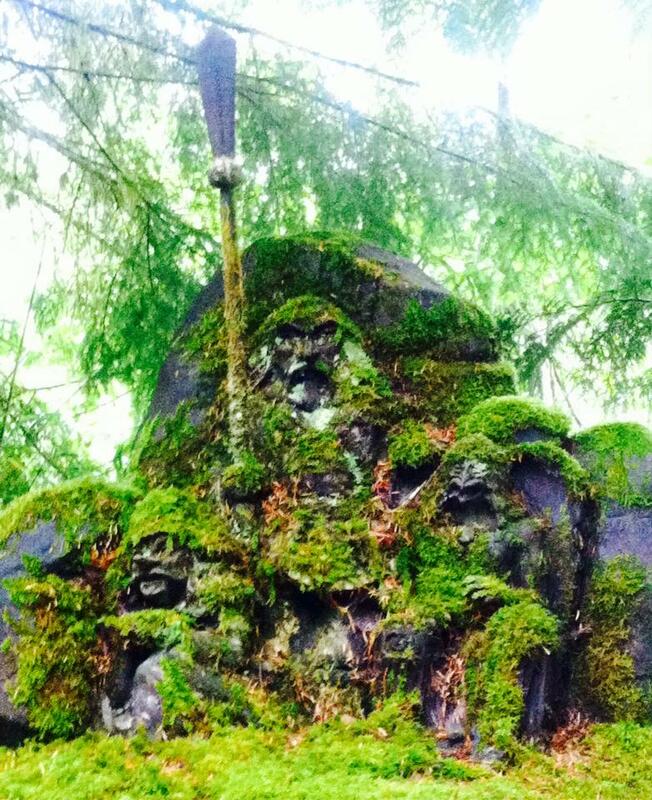 There was a small enclosure, overgrown with moss and populated by some kami. 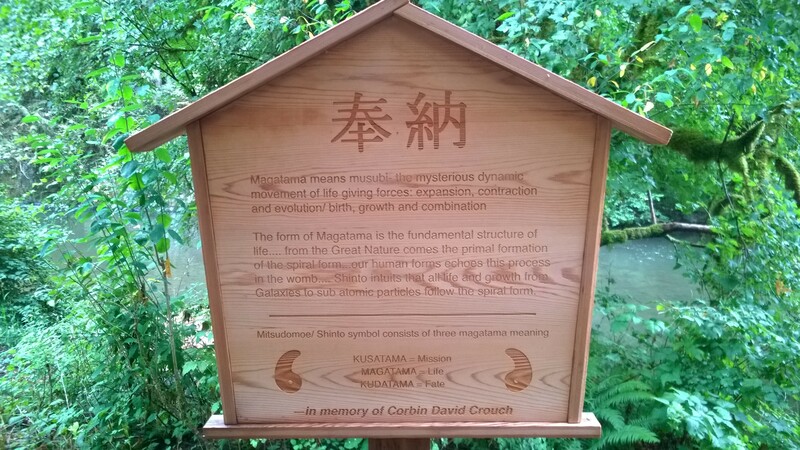 Nearby, there was a board to hang small plaques with wishes for the kami to read and bless. Here are the guardians sitting atop a boulder in that small enclosure. 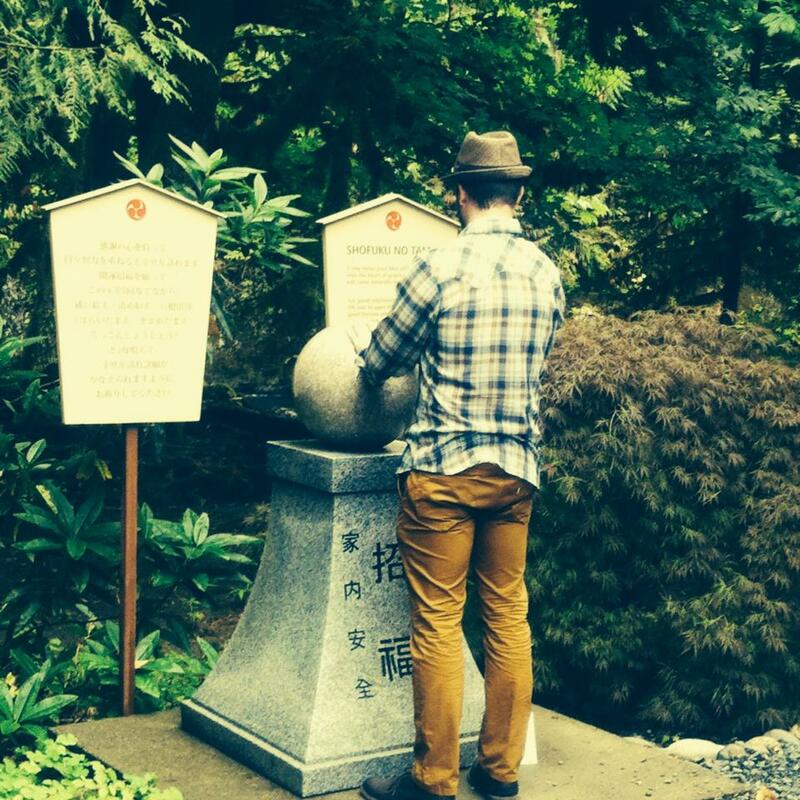 Here I am saying the prayer and rubbing the orb. 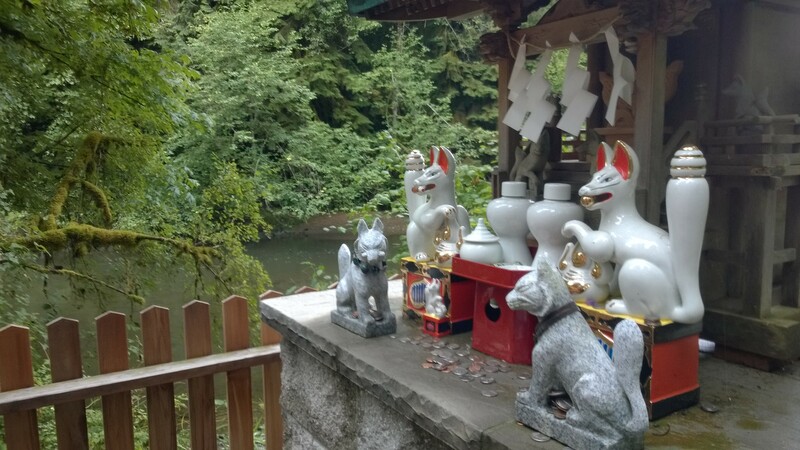 Finally, at the end of the path below the main shrine was a small shrine adorned with statues of mystical, white, Japanese foxes–those magical creatures of Japanese lore. This shrine had several of the iconic Japanese arches before it–in red and gold. Just beyond the arches, before ending at the fox shrine, there was a large stone in the shape of what looked like the yin from a yin-yang symbol. A plaque explained its meaning as well as the tripartite Shinto symbol made of three of these swirling icons. The plaque said that Shinto beliefs hold that the entire universe down to the structure of subatomic particles is composed of spirals. Thus, the spiral is a symbol for revering the myriad and mysterious unfoldings of nature. I was awestruck by this simple yet profound praise of Nature in a quaint forest glade. Here was a simple pointer to the wonder of All rather than “my” mastery of it. “I am sure everyone who visits the shrine is struck by the mysterious and undeniable beauty and the peaceful atmosphere that surrounds it. These are things I still notice everyday when I arrive. I find the earlier mornings at the shrine to be a true treasure because these are the times I can feel the world awakening around me. I love walking down the main path, listening to the birds and the river while seeing the morning sunlight shining through the trees. I can’t help but feel connected at these moments. May this adventure inspire you to see your engagement and interaction with nature. May it help you see your place within it, not different, not separate–but a piece of the whole; spirals all the way down.